Ease of flow monitoring with low maintenance benefits is a given with the compact plug and play EGE SNS 450 thermodynamic flow sensor from Countapulse Controls – the sole southern African agent for EGE’s full range of flow sensors and controllers. According to managing director, Gerry Bryant the innovative screw-in adaptor on the EGE thermodynamic flow sensor allows for universal use in a variety of applications. The adaptor is screwed into a T-piece or a welding sleeve and the probe is then secured in this adaptor using a union nut. Users are reassured of the integrity of the connection, which is sealed up to 100 bar. 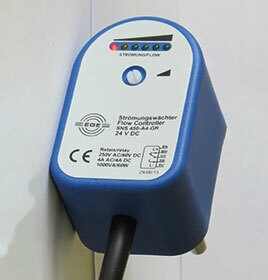 The EGE sensor, which includes an LED display for ease of use, can function in temperatures from -20 to 80°C and is suitable for controlling the flow of fluids such as water, glycol mixtures and chemicals. Ingress protected to IP67 standards, the design of the sensor, which features no moving parts, is focused on elimination of any failure that would be caused by oxidised bearings, torn impellers or deflector deformation. With a robust construction, the EGE flow sensor is resistant to corrosion and is ideal for use in both liquids and air, as well as in hazardous environments. “This is a welcome addition to the Countapulse Controls product line-up and complements the company’s existing range of sensing solutions. All are geared around reliability and longevity, combined with uncompromising accuracy,” says Bryant. Countapulse Controls offers a comprehensive range of sensing, measurement, counting, switching, monitoring and positioning instrumentation, with customer support provided through a round-the-clock technical advisory service hotline.